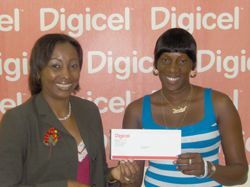 âFirst let me say I am very happy to have won, I have been a Digicel customer from the first day and I have never even considered switching and I am pleased with the service. I consider this winning as pay back for all the cards I have purchased and that makes me feel special,â said Charles. Someone will walk away with $150,000 at the conclusion of the competition this Christmas season. Every customer who tops up their account or fully pays their bill on time will get a chance to win. All they have to do is to collect the letters on the cards until the word DIGICEL is spelt and they will will be entered into the draw to win the grand prize. Those who Top Up using vouchers should also collect their vouchers and spell out the word DIGICEL. All Postpaid customers who pay their bills on time will be automatically entered into the draw.